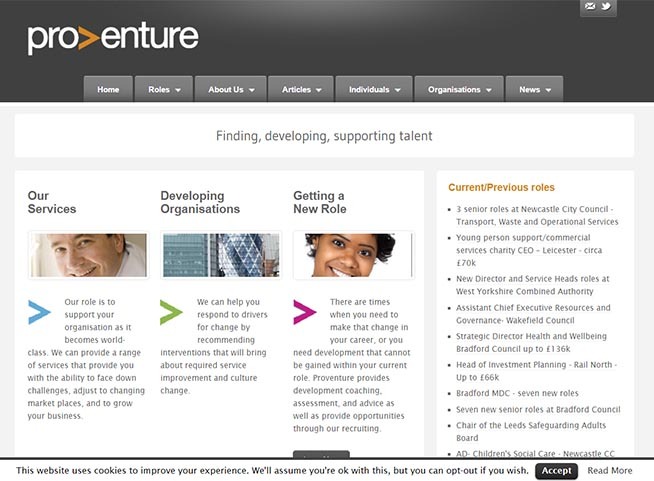 The client is a recruitment consultancy operating in the 3rd sector, that is, charities, councils and students’ unions. The roles that they fulfill are generally senior management, board members and trustees. The company’s previous website has been online for approximately 10 years. It has become very dated and difficult to use. The color scheme, although in vogue at the time for this type of business, was now seen as dull and uninspiring. Often with senior executive recruitment there is a large amount of information to pass onto prospective candidates. This includes information about the organisation, the role, the process and how to apply. Proventure Consulting needed the ability to host microsites within their main site as added value for their clients. These copy on these microsites include all of the information mentioned above, as well as links to relevant documents and external sites, and a contact form that provides the ability for prospective candidates to automatically receive the job description and a person specification. The microsite follows the recruitment process, and changes can be made quickly and easily by the recruitment consultants. Often recruitment companies provide this in a PDF on application or on a single short page of a website.